On a gloomy, rambunctious day at The Oval, the 2017 Champions Trophy was finally graced by a classic game. India and Sri Lanka is the most frequent match-up in one-day international history and has sometimes been synonymous with drab, instantly forgettable and context-free matches. Not here, though: the two produced a pulsating, oscillating match. It ended with Sri Lanka not merely winning but gallivanting to their target of 322. 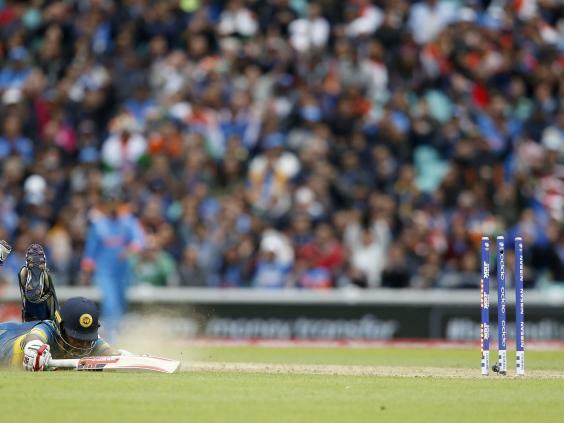 After Asela Gunaratne slog-swept Jasprit Bumrah into the Peter May Stand in the 46th over to take the equation to below a run a ball, India’s supporters, dazed and confused, rapidly filtered out, leaving Sri Lankan fans to revel in a gloriously unexpected triumph. “No one really expected us to win,” skipper Angelo Matthews said. Victory was secured when Matthews flicked Umesh Yadav to fine leg with nine balls remaining. Matthews, the team’s captain and batting fulcrum, had played magnificently in an unbeaten half-century that was unfussy, efficient and, as in the thunderous drive through mid-on that levelled the scores, supremely skilful. He had returned to the side, after a calf injury, with Sri Lanka in a state of considerably disarray. Along with their usual off-field tumult, they had won only one of their nine ODIs this year, including a thumping 96-run defeat to South Africa last week, and were recently crushed by an under-strength Scotland in a warm-up match too. To add to the mounting chaos, Matthews’ stand-in against South Africa, Upul Tharanga, was suspended for two games for Sri Lanka’s slow over rate; Chamara Kapugedera was ruled out for the tournament with injury too. It hardly made for an auspicious backdrop to face India’s behemoth. And when Sri Lanka were set 322 to win, there was no sense of what was to come. Niroshan Dickwella fell in the fifth over, early on a Bhuvneshwar Kumar slower ball. Minds pondered whether India would win by a higher margin than the Conservatives in the general election. And, then, Sri Lanka counterpunched. Danushka Gunathilaka, only called up to the tournament as a replacement for Kapugedera yesterday, batted with panache, audaciously reverse-sweeping Jadeja, and playing a series of ferocious lofted straight drives. More orthodox was Kusal Mendis, whose 176 against Australia in a Test last year marked him out as Sri Lanka’s next batting prince. Together the two added 159 for the second wicket. Imperceptibly at first, the sense that India could be overcome took hold. The notion crystallised in the 26th over, delivered by Hardik Pandya. In four consecutive balls, Gunathilaka was dropped at long on, Mendis creamed an off drive for four, top-edged another four, and then emphatically pulled another boundary. Suddenly, Sri Lanka were comfortably clear of the Duckworth-Lewis par score, which seemed relevant even though the rain never took hold. India were a little slapdash in the field; Ravindran Jadeja, who normally chokes the opposition in the middle overs, conceded 36 in his opening four overs. Two brilliant moments of athleticism from Indian fast bowlers hauled them back into the match. First, Yadav’s pinpoint throw from square leg ran-out Gunathilaka returning for his second; then, Kumar picked the ball up in his follow through and hurled down the stumps before Mendis could scamper a quick single. Sri Lanka looked as if they would be consigned to defeat at their own hands. That was reckoning without their middle order. While Matthews scored at over a run-a-ball without deviating from the orthodox, Kusal Perera heaved 47 until retiring hurt with a hamstring complaint. Gunaratne, though, carried on in the same impudent spirit. And so, as Sri Lanka waltzed to their target, India must have felt compelled to re-evaluate their own batting performance. In a sense they bat the way England tried to pre-2015: risk-averse, keeping wickets in hand, and then exploding at the death. Since the last World Cup, their average score in the ten-over Powerplay is 48. Against Pakistan they ended the first ten overs on 46-0; here, they cruised to 48-0 off ten. When Rohit Sharma was spilled by Gunaratne at square leg, who tipped his shot over the boundary for six, it brought up their second consecutive century stand of the tournament. On both occasions they have lost the toss on a gloomy morning and been inserted into bat. On both occasions, Sharma and Shikhar Dhawan have responded with steadfast defence and careful accumulation. Here, the upshot was that Dhawan scored 125. Man of the tournament during the 2013 Champions Trophy in England, he produced another methodical, controlled and calculated innings. Underpinned by his offside driving and cut, a shot he places with wonderful, wristy placement, as in the four through wide third man to bring up his century, Dhawan eschewed all risk until he had reached a century, when he finally deigned to hit the ball in the air, clipping a six over fine leg with nonchalant ease. India’s innings, then, was alarm-free, the only surprise that Virat Kohli was out for a duck, trying to glide Nuwan Pradeep down to third man. Sri Lanka’s support, hitherto becalmed, greeted Kohli with chants of ‘Who are you?’ as he trudged back. It seemed to matter little. Another Indian megastar, MS Dhoni, played with his usual mix of temerity and scampering between the wickets. India amassed 103 from the last ten overs, and so reached 321, a score that looked within their grasp from early in their innings. Yet to lose while essentially batting entirely according to plan raises a fundamental question: in the modern ODI age, is their approach simply too cautious? India were not just beaten by Sri Lanka’s steel; they were also defeated by their own paucity of ambition. Not that the tournament organisers will be complaining. 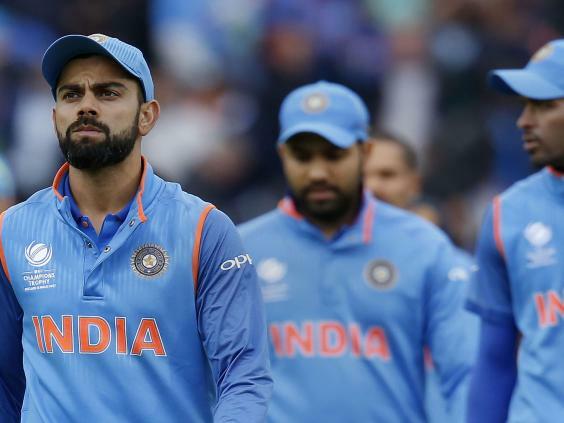 Both final matches in Group B – India’s clash with South Africa here on Sunday, and Sri Lanka’s match with Pakistan in Cardiff on Monday – are now effectively quarter-finals, with the winners advancing to the semi-finals. England will be quietly pleased too: their semi-final at Cardiff is almost certain to be against Sri Lanka or Pakistan. They would fully expect to beat both teams; then again, until two days ago, so would South Africa and India.